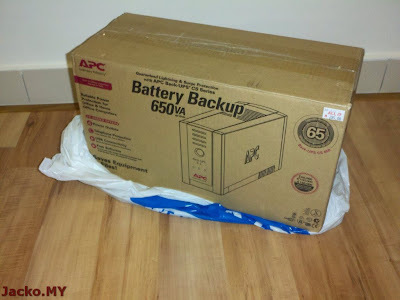 I replaced the battery of my UPS last year. 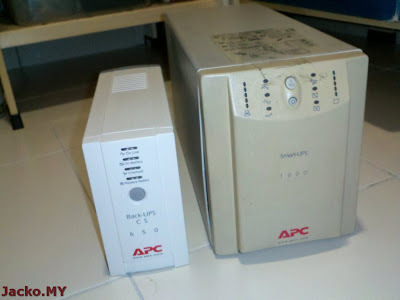 Unfortunately, the UPS was hit by power surge just before I moved house, thanks to power quality by TNB. 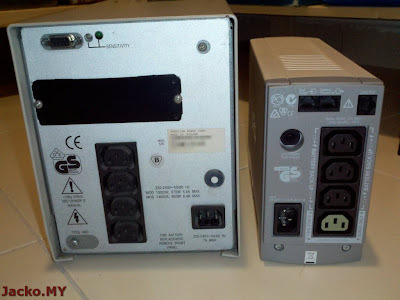 Fortunately that did not burn my gadgets but the UPS and power adapter. 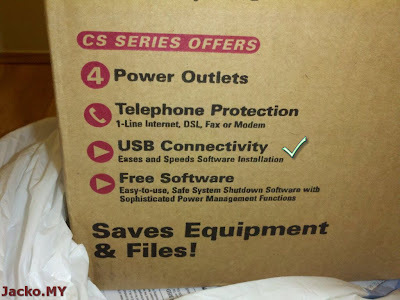 The USB connectivity for monitoring purpose. This feature comes with a premium. 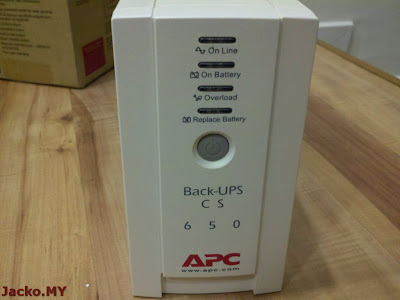 You will never know the condition of your UPS and how long will it last without this feature. 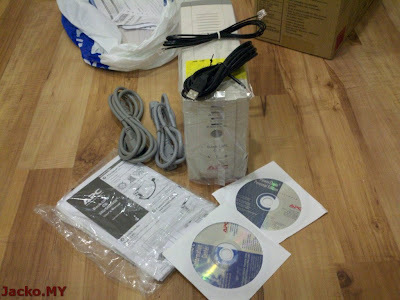 2 grey power jumper cables, user manual and warranty leaflets, 2 CD for information and monitoring software, 1 phone and 1 proprietary USB cable (with one end looks like a RJ45 terminator) for monitoring. Very simple front plate, a power button and 4 LED showing key status. 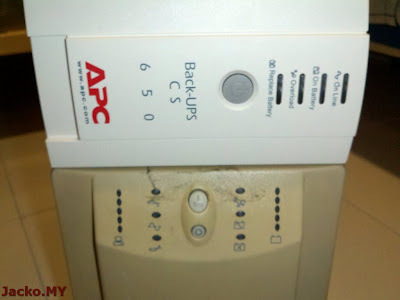 At the rear, a pair of phone in and phone out for modem protection; the data port for monitoring; circuit breaker; main power input source at the bottom left, 3 black colored surge + backup outlets and 1 grey colored surge protection only outlet. What is the difference? 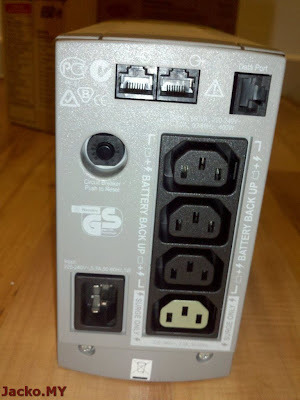 3 black outlets will protect the connected devices from power surge and provide backup power during blackout, whereas the grey outlet only protects the connected device from surge and doesn't output backup power during blackout. 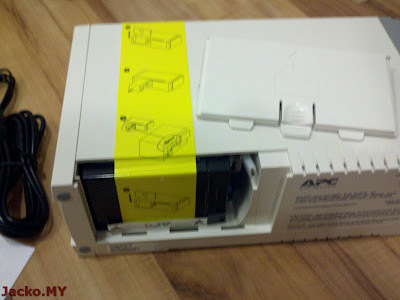 One example use of the grey outlet can be printer, that enables you to protect it but prohibits it from draining the battery during the blackout. 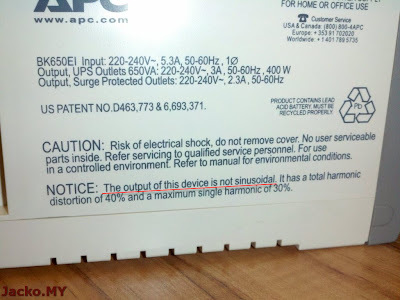 Understandably 50% of reduction in all dimensions because of 50% reduction in battery capacity. 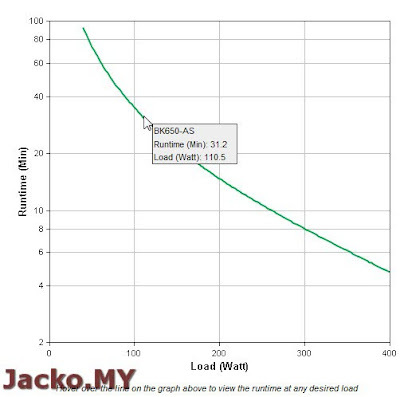 The old SmartUPS delivers 1000VA or about 615W whereas CS650 delivers 650VA or 400W. This is what you get if you connect the Back-UPS and SmartUPS to oscillator, respectively. The top one is step simulated sine wave and the bottom chart is pure sine wave. 30 minutes should be good as the netbook has its own battery as well. 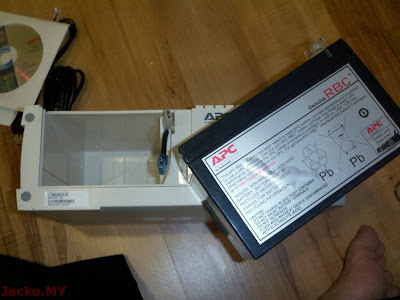 Read through the manual of the devices that you plan to connect to UPS to get the power load and you can perform your estimation at APC website. 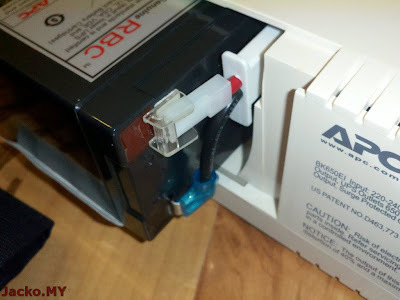 Clearly that the connectors are different, so it's very hard to connect the wrong polarity to the terminator. The software testified the online estimation chart. 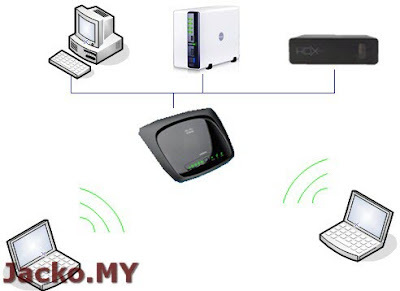 Few minutes less due to additional USB harddisks. 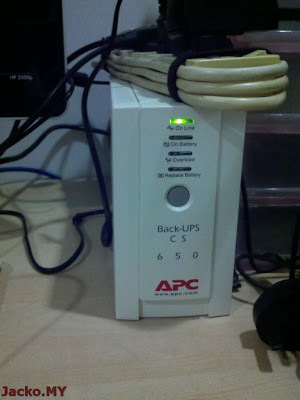 Oh, alternatively you can enable UPS service in Administrative Tools > Service to use Windows built in UPS service. Now at least the monitor and netbook are protected. 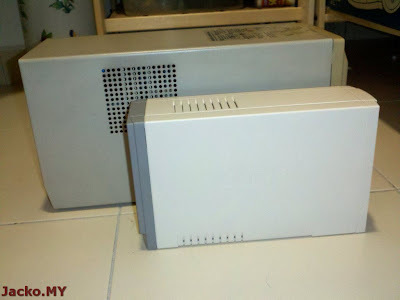 Next, the NASes especially the new precious Synology 1511+.